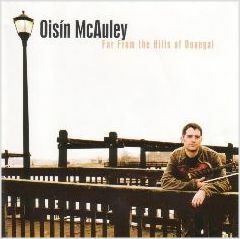 Without doubt, one of the best new fiddlers to come out of Ireland in some time is Oison McAuley. Though it’s not completely correct to call him new – he’s toured for years with a number of groups including well-known Danu - Mr. McAuley’s new CD “Far From the Hills of Donegal" represents his arrival as a solo artist. It’s in impressive effort. Like other Donegal fiddlers, McAuley incorporates styles from outside Ireland – Scottish influences in particular – into his playing with an, easy, natural touch. While this CD ranges over American bluegrass, jazz and even old show tune styles, it always sounds original, showing off Mr. McAuley’s technical prowess and pure feel in equal measure. What puts McAuley in a class by himself is his approach to improvisation. Rather than going back and forth between bars of a clearly defined melody and a stretch of jamming, he blends the melody and improvisation into a single piece. The result is music that feels extremely “live," even though he generally steers clear of the hard-banging jigs favored by pub players. The 13 instrumentals here seem comfortably traditional at first. But the more you listen, the more you realize how much they bend all the rules. For a taste of McAuley’s range, listen to “Con Cassidy" and “Souvenir of Venice," They’re two rather formal-sounding tunes from long ago, but the spirit of them couldn’t be more drastically different. “Con Cassidy" calls up the reserved, even sentimental feeling of an old time local dance. “Souvenir of Venice," on the other hand, makes you feel like you’re at a recital by a group of highly talented inmates who have, for the moment, seized control of the asylum. Kidding aside, the most lovely tune on the CD is "Lover’s Ghost," a mournful “air" that seems, in a brief few minutes, to convey the flavors of every American and Irish kind of music you can think of. Unaccompanied airs are tough. There are, quite frankly, a lot of uninteresting ones out there. But "Lover's Ghost" is a knockout punch, conjuring a sense of loss and loneliness that seems born of the player’s northwestern Irish roots. Oisin McAuley’s music certainly goes far and wide from Ireland, resulting in an album of subtle and very varied pleasures. On “Gille Le Bigot’s Swing and Tears," a light, jazzy Cape Breton tune, I couldn’t help but think I was listening to Django Reinhardt and Stephane Grappelli for a moment. But on the CD's final piece, “Port Na Bpucai," an earthy piping tune from Kerry that sounds almost like an organ hymn in a country church, the music comes full circle back to the shores of Ireland. It’s a world tour worth taking.